I walked somewhat unsteadily towards Vernon’s main gate on that crisp September night in 1970. The sky was clear but my head was not. I had been dined out in our magnificent wardroom with admirals looking down at us from their illuminated portraits; most with approval, some (the ‘dry ones’) not. I had stood on my chair and made a speech offering words of wisdom to the younger officers, probably boring them to tears. I had downed a tot of Pusser’s rum in a small presentation rum tub. After the speeches when the port had passed again and cigars had been lit by attentive mess stewards, the President rose, followed by we senior officers, and we made our way to the ante-room for serious talk, to put the country and navy to right while the younger officers indulged in their usual after-dinner fun and games. It was time to leave while they let off steam with their feats of strength. Some were in good voice with their bawdy songs, accompanied on the piano by the doctor – perhaps a doctor’s most necessary accomplishment in any ship. I passed the figurehead of ‘Ariadne’. I could have sworn the voluptuous lady winked at me. Perhaps it was the rum and wishful thinking. Having acknowledged the salute of the Officer of the Day and wished him a quiet duty, I passed under the ancient arch which had been there since the days when Vernon was an Army gun wharf, that I had marched through 32 years before to be indoctrinated in the Torpedo world and to be told how much better it was than those noisy gunnery people in that ‘other place’. They were right. I headed for the Portsmouth Harbour Station just in time to catch the last train to Warblington Halt. Fortunately, being in the diving world, I had several offers from diving companies. I chose Siebe Gorman & Co Ltd and became Manager of the Underwater Division, taking over from Captain Bill Shelford, also a former Superintendent of Diving and well respected in the international diving world. I was, of course, an innocent abroad in the cut and thrust of the commercial world. I was with Siebe Gorman for a long two years, hardly ever leaving my office before 2230. After three of my fellow managers had their heart attacks, two fatal, I decided there was no future for me in the commercial world – if I wanted to enjoy my pension. 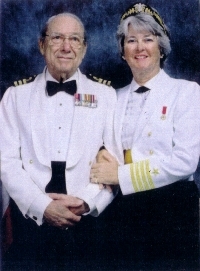 So I took ship (SS Canberra) to the New World and married Lt Cdr Linda Joan Balink, United States Navy, whom I had met in London when she was with NATO in 1964. We were married here in Pensacola, Florida at the Naval Air Station’s little chapel in 1973. Plan ‘A’ was for her to retire and join me in the UK. We made a better decision. Some people I know couldn’t take that arrangement for all kinds of reasons. They have to be in charge – or seen to be. But I had done my thing. I had come a long way since leaving school at the age of 14 in Bognor Regis, the youngest of 3 sons. My widowed mother was poor but proud. I went fishing ‘till I joined the RN in 1938. I was quite confident in myself, well adjusted, nothing more to prove and didn’t need to set the world on fire anymore – not too much. I would support and encourage Linda in her endeavours. I became a member of the Dennis Thatcher Club. It is said that “Behind every successful wife is an amazed husband”. Not so in my case; I knew Linda was going to the top. There are only three female Line Admirals in the USN and when Linda made Captain, only some 20 female Unrestricted Line Captains. There are female COs of ships – and pilots; some 63,000 women at sea. The CO of the naval hospital here, whom we know very well, is a female medical captain. She is about to go to London to CINCUSNAVEUR as the Navy’s top medical officer in Europe. We anticipate she will get her flag. Female officers form 10% of the USN officer corps and, at last look, a high percentage of ratings. Linda was president of many courts martial in Japan. She had a reputation of being tough but fair. I was more than happy with her promotions – her appointment as the first female Military Social Aide to the White House in the Richard Nixon era (I was even invited by him to a White House function – and did attend) and to be the first and, so far, only female defence attaché in the USN. I knew I could not have a second career. One day when we lived in Newport, Rhode Island I walked into the 172 room Newport Motor Inn and suggested to the owner that he should employ me. He agreed. I did a crash course on running a motel and became the Night Manager. There was a potential drama in every room including the lady who burst in saying, “I know he’s here with that woman. What room is he in?”. We never had a robbery but I was all ready to hand over the contents of the till if I looked down the barrel of a gun. I started work at 1600. Linda left her office about 1700. Not the ideal arrangement for newly-weds. She would come over and help out at the telephone switchboard, something I had not fully mastered. I had cut off many long distance calls in the middle of important business deals. I’m not too sure she did any better! We celebrated the morning of our first anniversary with Linda out on the snowplough clearing the drive so I could drive the owners to Boston airport. Me? Why, I was inside drinking champagne with them! After two years, Linda was appointed to the US Navy Post Graduate School in Monterey, California to read for her degree in oceanography. The local winery wanted a manager for their wine-tasting room. I convinced them that I was the greatest living European wine expert, using all the usual ploys such as holding the glass up to a candle while making classic remarks like “It has an amusing bouquet.” The tasting room was set in the the side of the mountain, very cold and damp. This was good for the wine but not for me. With glorious California sunshine outside, I would have become a frost-bitten alcoholic if I had stayed there long. Very soon, the job I really wanted came up. I took my salary in kind. Pay never tasted so good! I then became the First Officer of an Oceanographic research vessel operating in the area. I was back at sea on the bridge; I do have a Master’s ticket. Linda would be at sea in the school’s vessel, I in mine. We would chat on the radio – especially after I had broken my leg at sea in an unusual accident. Actually, there had been another position in which I was interested: Animal Control Officer (American for dog catcher). Handling a five stone dog was a basic requirement. I lost out on the job to Helga whose muscular build can be imagined. Linda says it’s just as well for we couldn’t have looked after all those lovely animals in our back garden. After two years it was time to move on. This time to Hawaii. Aloha! Linda was appointed to the HQ of the system that tracked Soviet submarines. Very hush, hush in those days. ‘Hawaii Five-0’ studios were looking for new faces and I, having always been a bit of a ham actor in RN theatricals, thought they would like to have a look at mine. By the time we left the islands, I had appeared in eighteen ‘Hawaii Five-0’ segments (once as a 3-star USN admiral), four major films, the pilot of the ‘Magnum PI’ series with heart-throb Tom Sellick when I played a US Marine Corps colonel (because the uniform fitted me better than the corporal’s), loads of TV and radio commercials. Whenever they wanted a chap with grey hair and a natty Gieves suit to play a doctor, chairman of the board, a person with military bearing, etc., they sent for me. On one occasion I was asked to wear a dark suit. I asked if a dinner jacket would be better. The casting director said with surprise, “You have one?” “But of course, doesn’t everybody?” Once, I also played an unshaven drunken dockside drifter watching a strip show in a sleazy Honolulu clip joint. In another episode, our red sporty Mustang car was used for atmosphere in a series of shots. That day, it earned more than I did! During my ‘career’ I followed the advice of the actor Spencer Tracy – “Learn your lines and don’t trip over the furniture.” I did – and I didn’t. For a very long time people would tell us we hadn’t really left the islands for they still saw me on TV. We had the foresight to buy a house there. Then it was on to dear, beautiful New Zealand – US Defence and Naval Attaché, working out of the US Embassy. Linda was the Defence, Naval, Air and Army Attaché. We got around the Pacific in an official capacity quite a bit including, never to be forgotten, Western Samoa where we got terribly sick with tummy trouble after a meal with a local chief. The Cook Islands were interesting. I organised the first Tour de Raro, a bicycle race around Rarotonga Island. Even Indonesia; US Navy ships weren’t allowed into New Zealand ports thus our far-flung adventures. Singapore and Malaysia were for fun. Just a month after we arrived, Fiji and Tonga were removed from our orbit and an independent attaché installed. Pity, but we did get there en route to somewhere else. At a reception at the Soviet Embassy in New Zealand, the Soviet Ambassador His Excellency Uri Sokolov presented me with the Soviet ‘Services Rendered’ medal for naval operations up in the Arctic during World War II; Russian champagne, caviar and attractive natashas. I made a speech – some of it in Russian. I think I knew what I was saying. The Cold War was ending. It was a good diplomatic exercise for both sides. Linda thought she ought to inform her head office in Washington DC that her husband was going to receive a medal from the Soviets. “He’s doing what? What are you doing even talking to them?” Linda had to explain that we had met them at almost every diplomatic function (wasn’t that why we were in the job?) and we all got along very well especially with their daughter Maria who spoke perfect English and by now should be married to a Kiwi. Interesting that the medal was awarded by a country that no longer exists. I have it in my study together with other ‘I like me’ items including a glowing commendation from the Defence Intelligence Agency for our time in New Zealand. Linda, in addition to a more glowing commendation, was awarded the prestigious Legion of Merit by her Ambassador on behalf of President Bush. I think we did a good job; VG(Sup) in fact. With my naval background, we made a very good team. It takes two to tango. We have always been a good team – especially in the attaché world. Before being selected for attaché duty, we were subjected to many interviews and background investigations. At one interview, Linda was asked about her drinking habits. Fortunately, they didn’t ask me. I would have found it difficult not to reply, “Since my wife rarely does, I drink doubles.” Some people might object to serving alcohol. No problems for the Roman Catholics. The Papal Nuncio to New Zealand liked the odd glass after a round of golf, and why not? We both did the three month generic course with the Defence Intelligence Agency to prepare us for our new adventure. Linda was the only female Attaché (Design); I the only male in ‘Spouseworld’. Veeeerry interesting. The only class I didn’t attend was ‘How to fold serviettes’ but I did observe the class given by Nancy Reagan’s hairdresser, designed to help the wives with their personal appearance. We had never seen an Uzi sub-machine gun firsthand although Linda had qualified earlier as a ‘sharpshooter’ with a .45 revolver. Have you ever driven a high-powered car around a racetrack while being pursued by the ‘bad guys’ and ramming and getting past another car being used as a roadblock? Linda did. The guys (in fear?) would take the power off before impact but Linda just went straight for it. The cry from the men was “Typical female car park driver. Must be a sale on.” But she did it right. If you have to hit another car (not recommended on a daily basis) don’t go for the engine section. Aim for the axle; it will spin around. We don’t know why they called it ‘defensive driving’. Walking around Washington DC trying to spot the ‘goons’ who were tailing us was a fascinating exercise. The guy taking photos of us from behind a potted plant was so obvious – "Boo!". During our lunch break in a mall, there was a place that printed headlines of your choice with the daily newspaper heading. I got ‘Linda Shakes Tail’. In America, I realised later that ‘tail’ also refers to part of the female anatomy. On station we travelled on diplomatic passports and, of course, we had diplomatic immunity. But we still had to pay our parking fines, if any. The Ambassador saw to that. We didn’t want to be PNG’d. We were ‘duty free’ to ease the cost of entertaining for which we had a modest allowance. There was a ‘fleet’ of two cars with a driver to allow us to arrive at functions in style. A gardener was provided; also a maid… live in if we wished but we didn’t. Dinner parties could be catered but we preferred to do it ourselves. More homely – which the Kiwis liked. The appointment was a super ego trip. We don’t think we got carried away. The jewel in the crown of Linda’s career. A great way for her to finish her 31 years in the USN. Social life was a bit demanding. We were given a splendid spacious furnished house, 75 years old and formerly owned by the local mayor. Over the three years we were ‘down under’, our guest book tells us we entertained just over 400 people, all at small dinner parties except 50 or so on Armed Forces Day. We also attended a similar number of functions. Having a quiet evening at home was very much appreciated. We put every invitation into large albums. We were working on our fifth when we left. Near the end of our attaché course they had to find a country for us. The Netherlands was considered. With Linda’s Dutch family background, that would have been perfect. In addition to French, she has a little Dutch – and Spanish. But it didn’t work out. Next was Denmark but they wanted a submariner. In France, the naval attaché is provided with a C12 jet aircraft which he has to fly. Linda was eager to learn but that was out. For Canada, someone was wanted with a specific type of operational experience – not Linda’s, so that was also a non-starter. Too cold in Ottawa, in winter anyhow. One of our course, an Army colonel, was already detailed for Singapore. Moscow was taken, as was Kabul. They could keep that one. The Air Force colonel who went there must have fled the country at least twice. “What about Peru?” they asked. We were told that the official transport was a donkey fitted with port and starboard steaming lights that would get us home after a party. They must have been joking… weren’t they? Thanks, but no thanks. West Africa was not available, possibly for the better. When the water and electricity go off for the umpteenth time and the house boy and cook quit just before an important dinner party, the cry to relieve tension is "WAWA!!!!" This means ‘West Africa Wins Again’. Thanks to the incumbent attaché, a male captain, extending a year, New Zealand became available. Another incident was when the wife, before going out for morning coffee with friends, told the house boy to go to the market and get two chickens for the dinner party that evening, pluck them and put them in the fridge. When she got back, there were the two chickens in the fridge, plucked, very cold and very much alive. She hadn’t said to kill them. Of course, they had made an awful mess. She gave orders that by the time she got back from a lunch party, the fridge was to be cleaned inside and out. When she got back, the fridge was on the front lawn. They had cleaned it ‘inside’ and were now cleaning it ‘outside’. In South America, the attachés were giving a dinner party. Mrs Attaché was sitting opposite an army general, resplendent in his white uniform. Attacking a roast potato, dripping with the best imported Bisto gravy, it flew off her fork and landed on the chest of the general, slowly rolling down the front of his uniform. His reply was, “No, thank you. I don’t require any more roast potatoes.” Ten out of ten for tact. A good one was from the East. Mrs Attaché was giving a buffet lunch party. She told the house boy to garnish the salmon. She was too busy. When she saw it again, it was beautifully decorated with tiny circles of red around a green centre. “Where did you find them,” she asked. The house boy explained he had found them in a white box in the fridge and had cut them into small slices. Somebody in the house had a haemorrhoid problem. We have a map of the world in the laundry. Blue flags mark where Linda has been on her own. She got up to Point Barrow, Alaska during her oceanographic post-graduate work. That’s as far north as one can get on the North American continent. Red flags for me and white where we have been together. That just about covers the world except for South America. (Maybe we should have gone to Peru after all!) Linda has one up on me in that she can put a flag at the South Pole; but I did get to 80 degrees north during the Spitzbergen Islands raid in WW II. We are now supposed to be really retired but we only say that when we go to bed. Until recently, Linda was the Captain of a ladies’ tennis team but she still plays three times a week. She has started a small business –‘Royal Oak Enterprises’ – which markets her stained glass and some costume jewellery she and her mother make. She is now compiling a cookbook of tennis lovers’ recipes entitled ‘Serve it Up’ with some profits to charity. Since we arrived in Pensacola to drop the hook, having sold our home in Hawaii, she has completed her Masters Degree in International Relations… a follow-on from our time in the diplomatic world. I have taken up oil painting which takes care of the Christmas presents. We both serve on several committees including reading on the local radio/TV for the visually impaired. We are both licensed amateur radio operators and can talk to the world. Linda got her license at age 15, having built her own equipment. While in Portugal, we were both very active. We were the land-based link with the tall ships racing from Bermuda to Portugal. We also assisted Tom McLain, former SAS, who sailed the then smallest boat ever to cross the Atlantic. He had previously rowed across it! We are members of an exclusive luncheon club that invites prominent speakers. We were told there was a five year waiting list. After being invited to (and attending) President Nixon’s funeral, we were suddenly elected. Hmmmm! We are volunteer ushers at our historic theatre which puts on Broadway and local productions. We get to see the shows for free. I can’t read the tickets very well. I’d have the whole place in an uproar like a Chinese fire drill. So, I stand around in a dinner jacket giving a poor imitation of the House Manager. The USN Base also put on the occasional special. The recent Glenn Miller Orchestra took me back. I am the Hon Local Officer for the RNSA in Pensacola. I do it whenever we are near the water and we usually are. In Hawaii I kept a good lookout from the bar stool of the Hawaii Yacht Club. Only one RNSA yacht came through during our time in the Islands. Knowing the then Secretary, Peter Thomas, I said in fun that my address for visiting yachts was ‘… the third palm tree on the left most days. If not, try the bar across the street’. This was actually published in the RNSA Year Book together with a cartoon of us under the palm tree, drawn by a friend who qualified CDO with me in 1953 and is now a Padre up in Nova Scotia. On arrival in Pensacola, we had to learn the local Southern language. A favourite expression of surprise is "Well, slap the dawg ‘n spit in the fiyah (fire)." It’s a great place here in sunny Florida and our adventures are only just beginning. We look at traditional rocking-chair-on-the-front-porch retirement ‘like a rubber-nosed woodpecker in a petrified forest’. One day, I’ll write that book – the story of my life – ‘It was a dark and stormy night’ – to pass on to our two grandchildren. These days when I type, some letters come out backwards – emoc tuo sdrawkcab – which is why people think I am 47. So NEVER, EVER… REVEN, REVE… THINK YOU ARE RETIRED.